At Abacus Technologies, we believe in continuing support for innovators in the automobile industry. Part of that support consists of providing leading-edge STMicroelectronics semiconductor solutions for your Automotive and Transportation projects. Our product portfolio offers customers with solutions that meet requirements in vehicle efficiency, driving experiences, and safety. By using M0-7 VIPower devices, the user can assess how to drive a complete car front lighting system with the combination of the CIP-M07-ADIS with the SPC560B-Discovery board. With VIPower, you can combine with the SPC560B-DIS Discovery to build your High Side Driver Automotive system. This pairing represents an ideal setup for applications in front and rear car lighting automotive resistive, smart power distribution, and more. 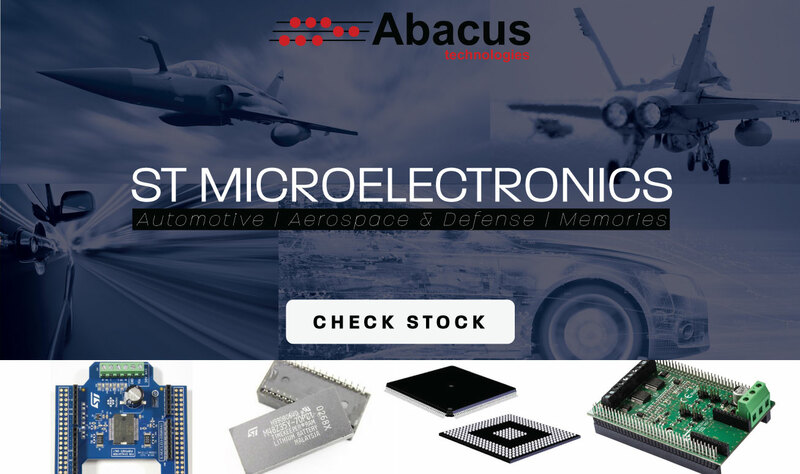 We carry a wide range of RobuST products such as microcircuits, power semiconductors, and specialty products designed for the avionics and defense industries. Due to prominent levels of radiation from high-energy particles emitted from aerospace applications, STMicroelectronics offers a portfolio of products designed, tested, and qualified to comply with the standards for aerospace. On top of this, we can supply these products for unbeatable prices. These products range from diodes and transistors to A/D converters and voltage regulators.